This research focuses on the automatic provisioning of cloud resources by an intermediary enterprise. This enterprise provides a virtual private cloud for a single client enterprise by using resources from a public cloud. The intermediary cloud provider is controlled by a broker that uses techniques to dynamically control the number of resources used by the client enterprise. The research presents a hybrid auto-scaling technique based on a combination of a reactive approach and a proactive approach to scale resources based on user demand. The primary goal of this auto-scaling technique is to achieve a profit for the intermediary enterprise while maintaining a desired grade of service for the client enterprise. The second goal of the technique is to reduce costs for the single client enterprise. The technique supports both on-demand requests and requests with service level agreements (SLAs). 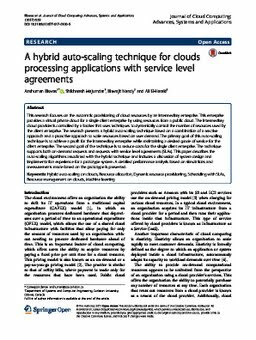 This paper describes the auto-scaling algorithms associated with the hybrid technique and includes a discussion of system design and implementation experience for a prototype system. A detailed performance analysis based on simulations and measurements made based on the prototype is presented.